I started this painting on location at Trough Hill Farm in Middleburg, VA. A property with 200 year old trees and a clear view of the Blue Ridge. The palette of chromatic black, ultramarine, alizarin permanent, cad orange and cad yellow medium remains a fairly experimental one. I haven't used it again. This was my first time using Galkyd Lite medium. It was a hot day and the paint started to dry on the palette before I could get it on the canvas. To speed things up I troweled on most of the paint with a painting knife then worked it with a brush. The result is a great deal of thick paint and a lot of texture on the panel, especially in the foreground. 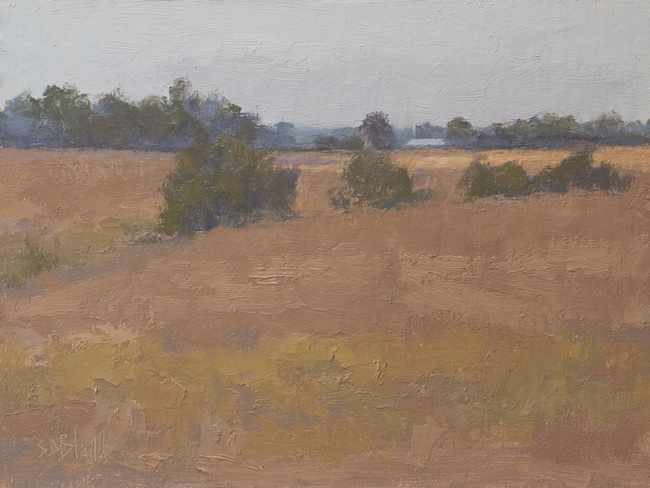 Back in the studio I added a band of lighter color to the field and pushed some of the trees further into the distance. Later on I added the suggestion of a farm building on the horizon.